The holidays are right around the corner. Turkey, mashed potatoes, stuffing… We will fill our faces with fun, food and football. And when Thanksgiving Day is over, the best is still to come – Leftovers! But today, we want to talk about different leftovers. While Thanksgiving leftovers are some of the best leftovers out there, there are other forms of leftovers that are more exciting – and involve extra revenue. Everyone has a marketing budget which can be difficult to stick to. It’s easy to get lost in the the many marketing opportunities out there, and you end up losing focus and spend extra in an effort to maximize exposure. However, when done correctly, you should find yourself in the green with your marketing funds. So what do you do with that money? Save it? Reinvest it in another marketing idea? You use those leftovers for you and your restaurant! If you aren’t currently promoting your business on social media channels, now’s the time to test and see what all of the fuss is about. Take your advertising a step further. Instead of doing a regular Facebook or Instagram campaign, implement some A/B testing for your campaigns. By testing different ads with various content (photo, text, and audience), Facebook and Instagram will let you know which ads are connecting with your customers better. Doing this also helps you better define and determine who your audience is. If you are looking to build out your restaurant using new software, systems or just want to learn how to be a better manager, start planning on attending a local conference. Conferences can be pricey, depending on the content, but if you have extra cash to spend, this is a great place for it to go. You don’t want to fall behind on what trends are hot in the restaurant industry or what tools might help improve your operations. Take a look at what expos are coming up in 2019 and begin planning accordingly. Are you currently using the free versions of various online softwares or tools? Now’s the time to finally invest in upgrading your subscription plan to get more out of the services by becoming a premium member. There is no reason to continue missing out on the maximum value of a service if you have money available. Becoming a premium subscriber can make all the difference in your time management and the type of experience you are providing to your customers. Use this extra money to invest back into your team. Maybe your crew needs a break. Send them to go bowling together or throw a party to celebrate your successes. If you are looking for something more formal, consider doing some internal training. Communicate to everyone that there’s always room for improvement, and bring in a team speaker or builder to hold a workshop for everyone. This will prep you all for an even better upcoming year and get you all motivated to pursue continued success. This might seem like the wrong suggestion since you hit your marketing goals by 1.) making a plan, and 2.) sticking to the plan without overspending, but use the money to add additional content. During the year, you might have run into a few occasions where you wish you had budgeted more for one thing versus the other. Knowing that you have this extra cushion, use it to your advantage by reinvesting it back into your business and your creative efforts. Shell out that money for a fun and engaging behind-the-scenes video or execute that direct mail campaign promoting your new online ordering site so all of your local customers are informed. 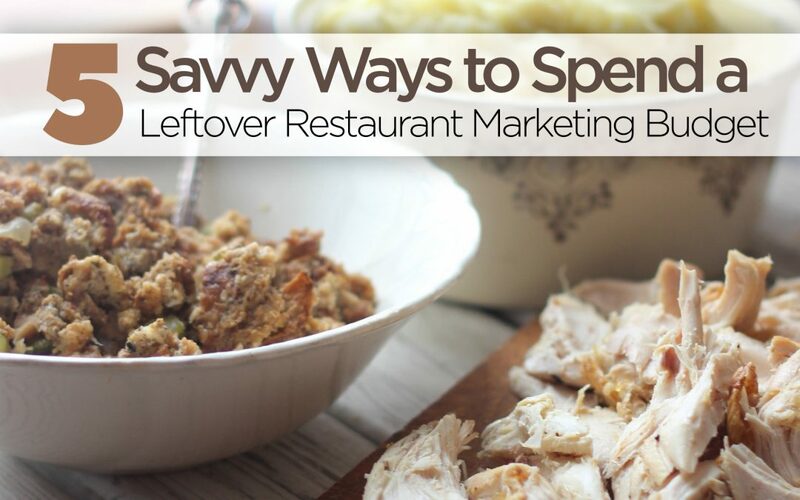 Leftover budgets don’t always come often, so it’s important to make the most of it!